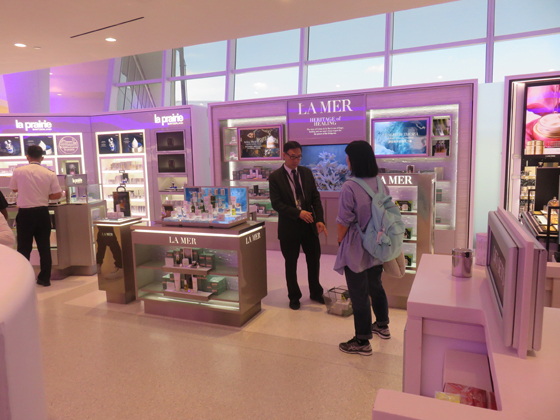 International Shoppe’s new 7,200 sqf stand-alone Beauty Store at New York’s JFK International Airport Terminal 1 is proving to be a huge hit with passengers, who are embracing the enhanced space and new brands with strong sales. 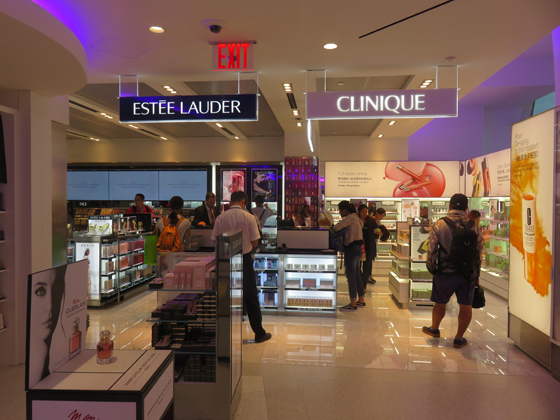 International Shoppes has taken the next step in its travel retail evolution with the opening of a 7,200 sqf stand-alone Beauty Store at New York’s JFK Terminal 1. Travel Markets Insider had the opportunity to tour the beautiful new store the day after its opening last week with IS vice presidents Scott Halpern and Matt Greenbaum, who are thrilled with the results. “We tried to keep the space very open and I think the result is that customers come in and are able to have great viewpoints of all the brands that are featured throughout the store. The flowing nature of the design elements in the ceiling and the floor really encourage customers to circulate throughout the space,” says Greenbaum. “After the first day, sales are strong. It is exciting to see how the consumers behave. Before, when there were 15-20 consumers in the store, it was not inviting to walk in. Now we have 50-70 people, and there is ample space for shoppers to move throughout the space,” says Halpern. The new Beauty Store is directly across from its previous location, which will now have more room to showcase the non-beauty categories. The new location is in the space originally occupied by Japan Airlines’ First Class lounge, which is now sharing space with Air France’s First Class lounge. “The Beauty Boutique is an A+ location. The lounge was in a great space and allows us to enhance the duty free experience at JFK Terminal 1. Our old space was built 20 years ago. The way that consumers shop today and the way the store was built 20 years ago don’t jive,” say Halpern. With 7,200 square feet of space specifically dedicated to beauty, the new store more than doubles the space IS had previously been able to give the category. The old store featured 2,000 sqf for beauty as well as a separate 700 sqf Estée Lauder and Clinique boutique. Today Estée Lauder / Clinique has its own entrance to the new beauty store. 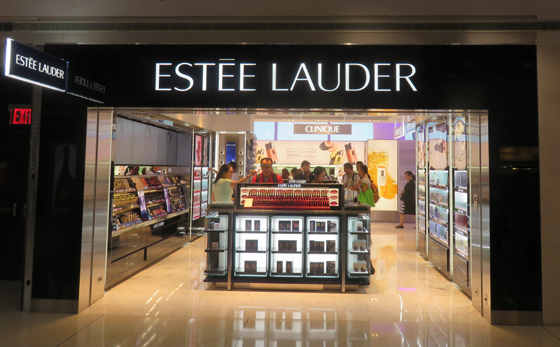 Estée Lauder and Clinique feature a separate entrance, distinct from the overall Beauty Store. 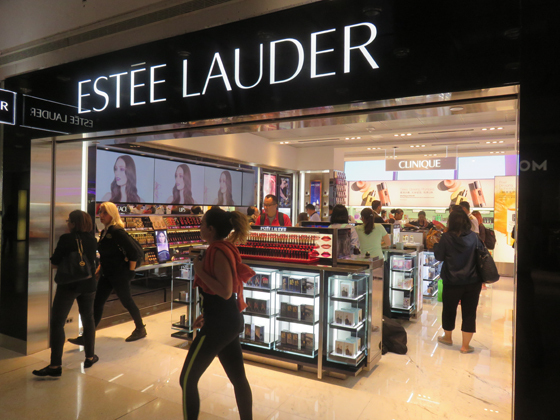 IS says the new location has allowed the travel retailer to both expand the space each beauty brand has as well as introduce new brands not available before in the terminal. 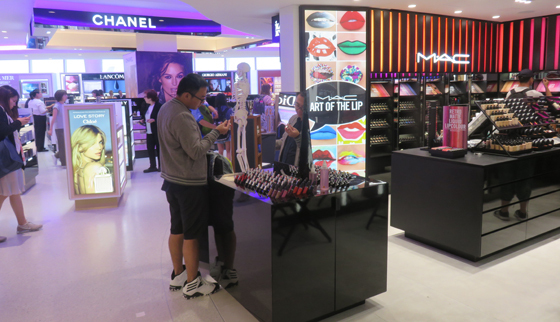 “All the brands that we previously featured in the old duty free store are now more expansive,” says Greenbaum. “We were able to partner with 21 branded experiences. On top of the brands being able to enhance their experience to the consumer, we are also able to bring on newness. “We have several new houses that were never in this terminal,” he says. “We have MAC, with which we have been trying to partner and find the proper solutions for the better part of ten years. MAC, Kiehl’s, Joe Malone and Tom Ford are four branded boutiques that never existed before. Giorgio Armani and YSL were fragrance only and now we carry the full line. We are also introducing newness by bringing in SK II for the first time,” says Halpern. 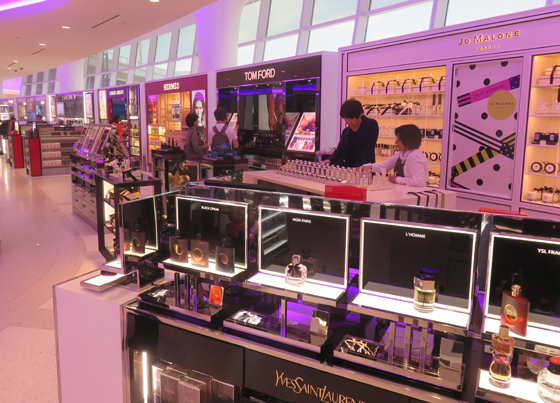 IS’ next project is the renovation of its old 5,800 sqf duty free store in Terminal 1. 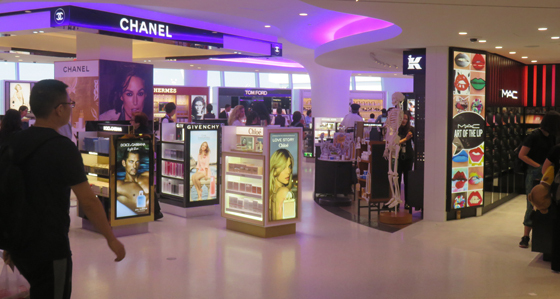 When the renovations are completed, IS will have 17,000 sqf of duty free retail space in the terminal. “It’s an evolution and we are not done. We’ve been continuously upgrading and redesigning stores for the last three or four years. And this will continue with this next duty free space that we are doing here at terminal 1. Ultimately the two spaces will be married through design. The store fronts will be mirrored so the customer will easily see that the stores are connected in some way,” says Greenbaum. “We are going to have a better footprint for the consumer to see luxury fashion, luxury watches and jewelry, and enhance our confection business and our liquor and tobacco business,” says Halpern. The size of the tobacco area will double from what it is today. 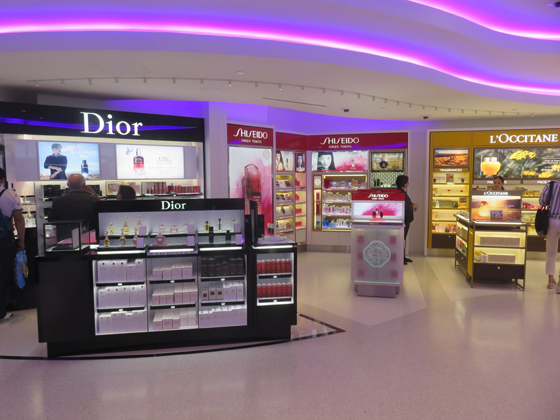 “One detail that should not be overlooked for the renovation of the upcoming duty free store is the fact that Phillip Morris will be designing and building their first category solution,” says Greenbaum. 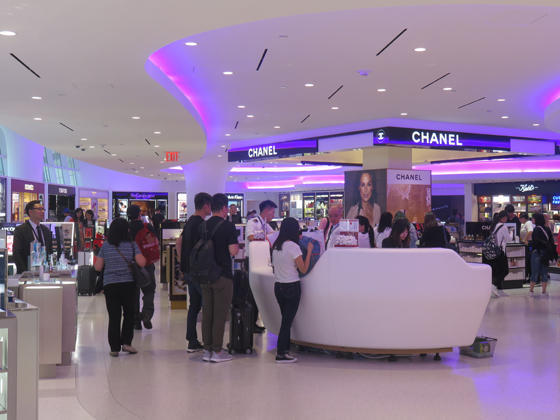 International Shoppes’ construction period has given it an opportunity to implement some pop-up spaces within the existing duty free footprint and on the perimeter. 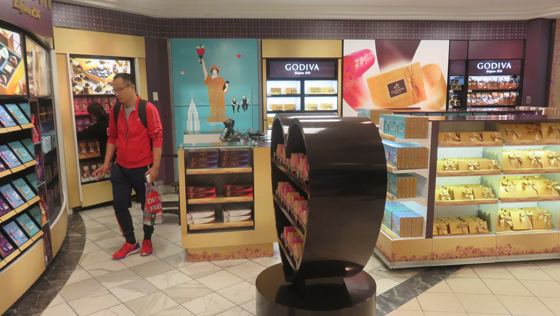 “We were able to convert the former beauty space and a former series of beauty boutiques on the outside the store into Godiva, Johnnie Walker, Hershey’s, another space that features Toblerone, Lindt, and M&Ms, as well as a Moet boutique,” says Greenbaum. 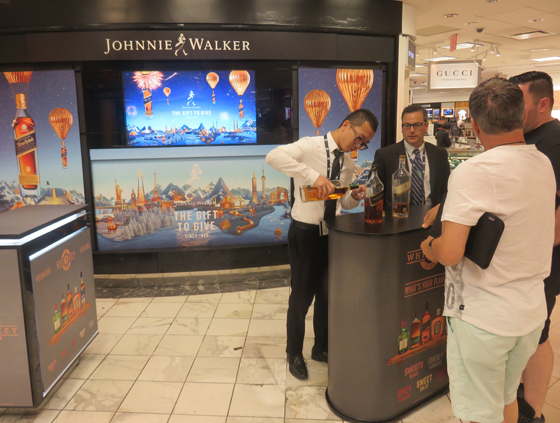 Space previously occupied by beauty brands across the corridor have been converted to Pop-Up areas, such as this tasting space for Johnnie Walker. Greenbaum says the opening of the new store and the renovation of the existing duty free store were critically important for IS.